Vision Park Hotel and its alliance Sunshine Park Hotel are strategically located within Klang Valley. Together, there are 5 branches within Klang Valley. No. 1A, Jalan Perdana 10/10, Pandan Perdana, 68000 Ampang, Selangor. No. 16, Jalan Bunga Tanjung 9, Taman Muda, 68000 Ampang, Selangor. are situated in Ampang, which is just 10 minutes drive to the Golden Triangle, where you will find popular shopping complexes like Sungei Wang Plaza, B.B. Plaza, Low Yat Plaza, Lot 10 Shopping Centre, K.L. Plaza, Starhill, Pavillion K.L., Times Square and many other night entertainment centres. It is also within easy reach to Kuala Lumpur's modern landmarks of Kuala Lumpur Tower, KLCC Petronas Twin Towers, Mid Valley Megamall, etc. No. 33, Jalan SG 1/6, Taman Sri Gombak, 68100 Batu Caves, Selangor. is just 5 minutes drive to the famous Batu Caves. It is surrounded by eateries and local shops and only 15-minute drive from Kuala Lumpur City Centre. No. 13, Jalan Bandar Rawang 3, Pusat Bandar Rawang, 48000 Rawang, Selangor. is situated within the Pusat Bandar Rawang and it is only 12 minutes away from the famous Templer Park water fall, where you can find numerous picnic areas along the two streams and you will find visitors almost anytime. Strategic location and competitive prices are two advantages of booking a stay at Vision Park Hotel and Sunshine Park Hotel. As budget hotel, we build our rooms to suit the needs of business and leisure travelers, no more and no less. The price is precise for any budget-minded traveler, the location is strategic and most importantly we are CLEAN,COMFORTABLE and CONVENIENT. 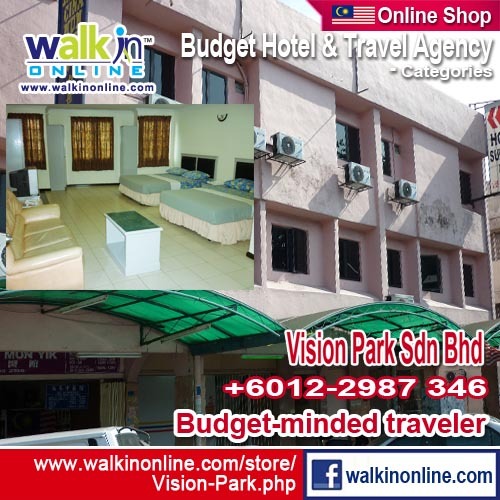 Guests on a trip to Kuala Lumpur can expect a pleasurable stay at both Vision Park Hotel and Sunshine Park Hotel, feel the genuine hospitality and services that will make you feel like you stayed right at home. Please note that guests are required to settle the first night's payment to secure the reservation, otherwise the booking will be cancelled. The hotel will contact guests directly with instructions for the bank transfer. Please note that the hotel has no credit card facilities and payments are to be made in cash. Additional Hour: Surcharge of RM10.00 per hour applied.